For decades, scientists and doctors have known that bacteria in soil were capable of manufacturing streptozotocin, an antibiotic compound that is also an important treatment for certain types of pancreatic cancer. What was less clear, however, was exactly how bacteria managed to do it. Led by Emily Balskus, Professor of Chemistry and Chemical Biology, a team of researchers has untangled that process, showing for the first time that the compound is produced through an enzymatic pathway and revealing the novel chemistry that drives the process. The study is described in a February 7 paper published in Nature. What makes the molecule such an effective anti-cancer agent, is a chemical structure known as a nitrosamine—what Balskus called the molecule's reactive "warhead." Known to be highly reactive, nitrosamines have been shown to be toxic in a host of other compounds, and are most commonly known outside of cancer treatment as a carcinogens found in everything from tobacco to cured meats. "This chemical motif has a great deal of biological relevance, and has been investigated thoroughly," Balskus said. "Until our work, the view of how this chemical motif was generated in biological systems involved non-enzymatic chemistry—it was just something that occurred under the right conditions." Balskus and colleagues, however, suspected the story may be more complex, and set out to explore whether bacteria evolved a natural pathway to produce nitrosamine compounds. "That's what we found in this paper," she explained. "We discovered the biosynthetic genes and the biosynthetic enzyme the bacteria use to build streptozotocin. "And what that revealed was a big surprise in terms of how this functional group gets made," she continued. "Because it turns out it's made by an enzyme in a very different way than all other known routes to make nitrosamine. The reaction has very limited, if any, precedent in biological or synthetic chemistry." What Balskus and colleagues found was an iron-dependent enzyme with two different domains, each of which catalyze different steps in the process. "Both of these domains had been associated with other chemistry in enzymes, but in the context of this protein, both are doing things that are really new," Balskus said. "So overall, from a purely chemistry perspective, it's a very exciting enzyme." It's equally exciting from a biological perspective, she added, because it shows for the first time that biology evolved a specific pathway for manufacturing nitrosamines. 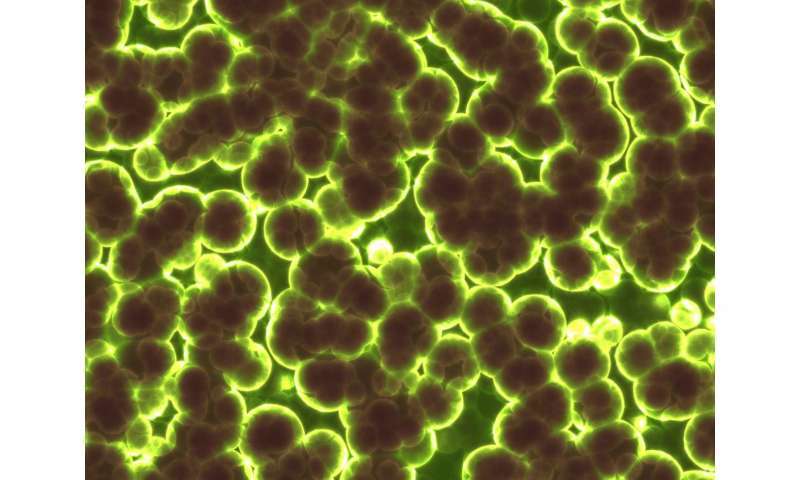 "And when we search bacterial genomes for enzymes that look like this one, we see a lot of them, including some in gene clusters in human pathogens and in organisms that live in symbiosis with plants," Balskus said. "So it seems that we have underappreciated how nature might be using compounds like this. The discovery that there are dedicated enzymes for making this type of functional group, and the fact that it may be made by so many types of microbes suggest an important role for its biology." Going forward, Balskus said, she is working with collaborators to understand how the enzyme works at the molecular level and to better understand the intermediate steps in the production of nitrosamine. Balskus also hopes to investigate whether and how other bacteria—particularly human pathogens—rely on similar enzymes to produce compounds that are potentially toxic. "The question we want to answer is whether this new type of enzyme is allowing human pathogens to do something that is damaging the host," she said. "Now that we've found these gene clusters, we can start to ask what these other N-nitrosamine containing compounds might be doing."